As the UK gets ready to commemorate one hundred years since the end of the First World War, a new film, Eleven, directed by Sean Cronin and Rock Salt, takes a look at the final days of the conflict. To celebrate the film’s release on 19th November, we explore five major films about The Great War. Directed by Jean-Pierre Jeunet, 2004’s A Very Long Engagement tells the story of a young woman, Mathilde (Audrey Tautou), searching for her fiancé who went missing from the trenches of Somme during World War I. Mathilde has an inkling that her fiancé Manech (Gaspard Ulliel) could possibly still be alive and goes on a journey to discover what happened to him. As she searches for her fiancé, she discovers the reality of the trenches of Somme during World War I. Released in 1999, The Trench tells the story of the last days of the Battle of Somme in 1916. The film follows Billy Macfarlane (Paul Nicholls) and Sgt. Telford Winter (Daniel Craig). The film unveils the poor conditions and the mental struggle of the soldiers and how they are affected by the atrocities of World War I. Directed by Peter Weir, Gallipoli , released in 1981, tells the story of two Australian sprinters who end up fighting in the Gallipoli campaign during World War I. Archy Hamilton (Mark Lee) and Frank Dunne (Mel Gibson) both have an interest in running and decide to both enlist in the Army and fight in World War I. Both Frank and Archy end up at the Australian and New Zealand (ANZAC) and as time passes, they become disenfranchised and hardened by the realities of the war. The film’s exploration of the loss of innocence of the young men who found themselves caught up in the war’s atrocities mean that Gallipoli isn’t one to miss. Based on Erich Maria Remarque’s classic 1928 novel, All Quiet on the Western Front was adapted into a film in 1930 and then remade in 1979 by director Delbert Man. The film stars Richard Thomas as Paul Baumer and Ernest Borgninge as Stanislaus Katczinsky, German school boys who want to enlist in the German Imperial Army during World War I. The film, like its source material, does a stellar job of conveying a sense of the desolation and turmoil of life in the trenches. Directed by Sean Cronin and Rock Salt, Eleven is available for pre-order on all digital platforms at from 11am on Sunday, 11th November. The film follows events on the last day of the Great War up to the conflict’s end at 11 o’clock on November the 11th, 1918. Just moments before the end of hostilities, a foolhardy order ricochets through the front-line trench. Sergeant Archie Jones and his pals find themselves going over the top one last time. All they had to do was wait just one more hour. As eleven o’clock approaches, Archie, badly wounded, slips between two worlds, but when all seems lost, help is offered from an unexpected hand. 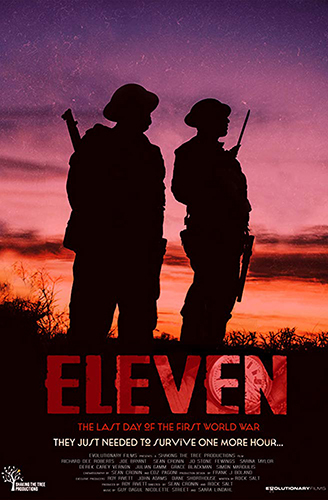 Eleven will be released on digital download on all major platforms in the UK on Monday 19th November.